Avatars will have an inventory of virtual items. They will be able to buy, sell, build, trade and loot virtual items. A server manages all these items and everything you do with items. Over the last 3 weeks we implemented such a component. This is our first version of a virtual item server. It is called "Neptun". In October and November we implemented a first version of the web portal and a simple form of an inventory. Back then, we simulated our items. Now, they are real. The inventory is now populated by the item server. In other words: items are alive inside the item server. 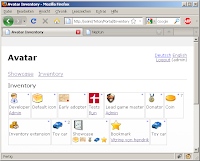 If you see them on the web portal, then the portal fetches all it needs to display them from the item server. As usual, items are also stored in a database for safety. But in the database they are only passive. In the item server they are active and you can do something with them. What you can do comes later. For now these items have a place to be seen (the inventory of the portal) and a place to live (the item server). It is actually much better to see virtual items on a web page of the portal, than in the item server. On the portal they have translated text and images. Developers can also see items in the item server, but this is much more bare bone. So, this is how Neptun looks like. It has a web user interface, but it shows only technical data. 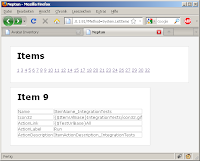 There is a list of item numbers and item properties. Not much for the user, but very informative for developers. For the programmers: Neptun is implemented in C#. We program, debug and test in MS Visual Studio 9. Then, we run the program on Linux with mono.